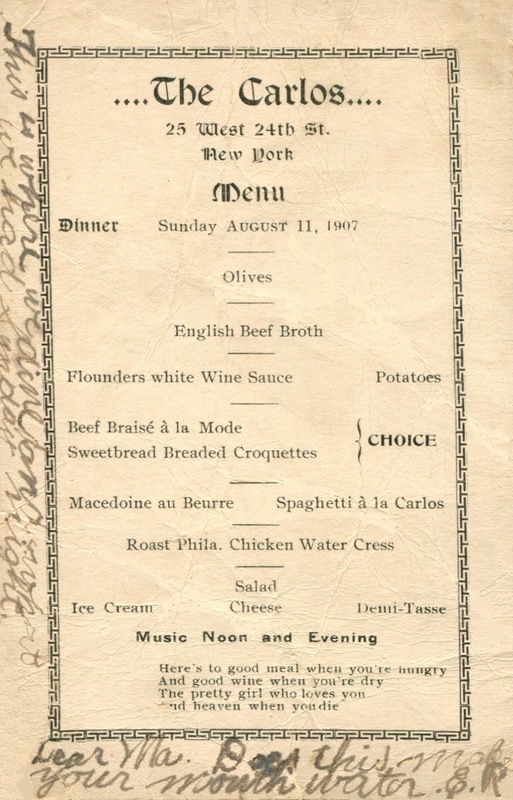 Postcards were then a new thing, providing an ideal way for a small restaurant featuring a foreign cuisine to advertise its fixed price menu; such places were known as “table d’hotes.” The postcard below shows the set menu for Sunday, August 11, 1907. 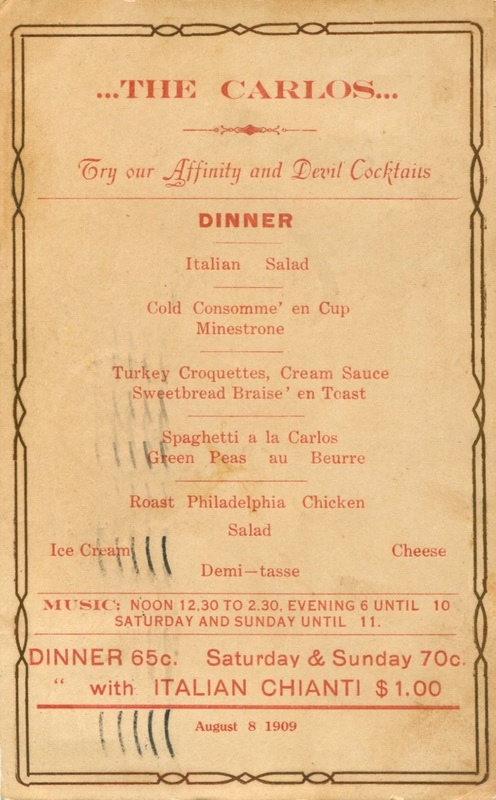 Italian table d’hotes typically employed this basic format for their fixed price menus which usually included an eponymous pasta dish like the spaghetti a la Carlos offered here. 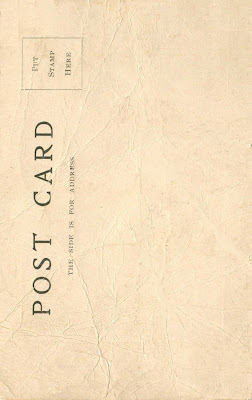 Although the above postcard was never mailed, it has a personal note written in the front border. It was not until October 1, 1907 that the Universal Postal Union allowed postal cards of member nations to have written messages on the address side. 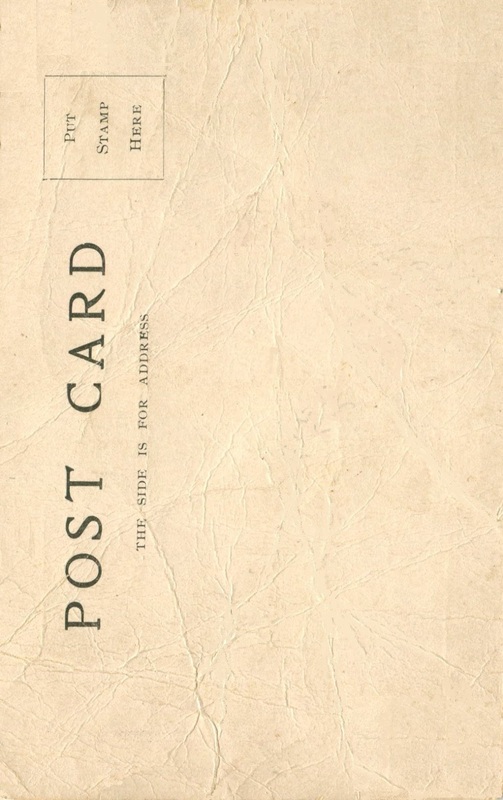 After the ruling, printers placed a vertical line on the back, ushering in the so-called “Golden Age of Postcards” that lasted until about 1915. The main dining room of the Carlos is shown on the card below. The couple returned to the “Carlos table d’hote” for dinner on September 16 of that year, partly to celebrate a commission he received from Scribner’s and partly because Dolly was tired, having put up twenty-two jars of peach jam that day. The restaurant was only a five-minute walk from their apartment at 165 West 23rd Street. The postcard below comes from Sunday, August 8, 1909. 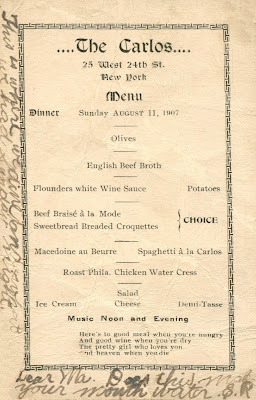 On the weekends, the fixed price menu was seventy cents, a nickel more than the regular price. Once again, spaghetti à la Carlos appears as the pasta dish. 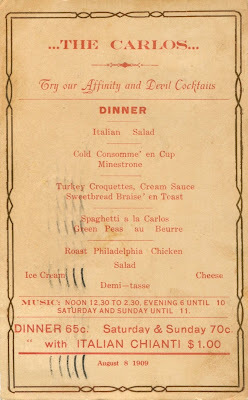 In addition to its set themed dinner, an Italian d’hote served typical American food. 1. 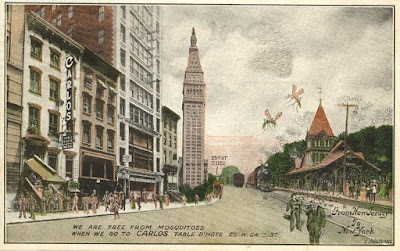 My thanks to Ephemeral New York for directing me to the blog Stuff Nobody Cares About which kindly granted permission to show this postcard. 3. John Sloan and Bruce St. John, New York Scene: 1906-1913, p. 242, 247, 277, 328, 332. 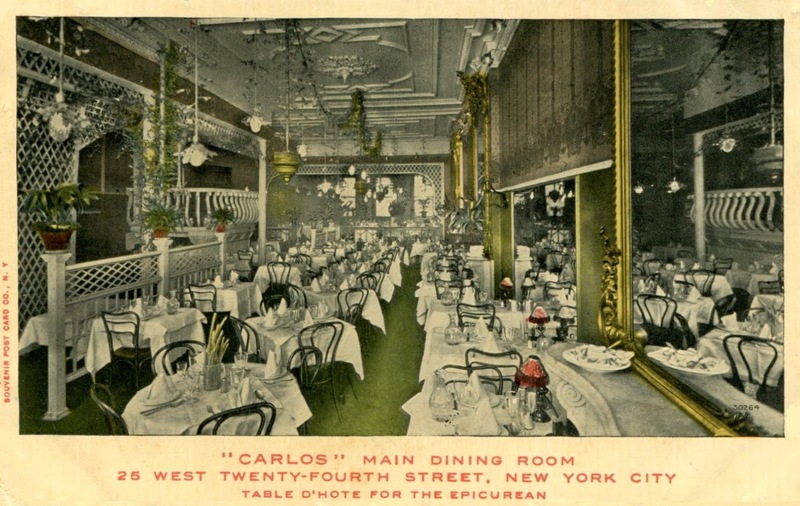 The artist refers to the restaurant as Carlos, Carlos', the Cafe Carlos, and the Carlos table d'hote. 4. 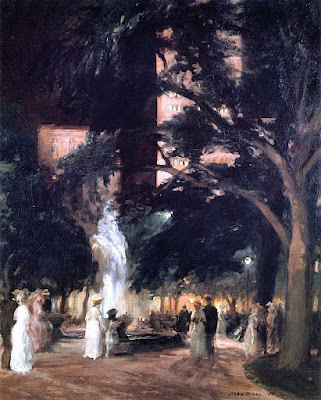 Sloan painted the fountain in Madison Square Park in 1907 and 1908. The later version shows the multi-tiered water feature that had been removed by the time it was painted. 5. In February 1909, Sloan noted in his diary: “Felt restless so went to the Chinese restaurant and was glad I did for I saw a strikingly gotten up girl with dashing red feathers in her hat playing with the restaurant’s fat cat. It would be a good thing to paint.” Completed later that year, “Chinese Restaurant” is one of his most iconic paintings. 6. The recipe for the Affinity cocktail is shown in Hugo R. Ensslin, Recipes for Mixed Drinks, New York, 1916. My thanks to Gary Gillman for this reference. 7. “Koster and Bial’s” may refer to a saloon on 24th Street at 6th Avenue, once the annex of a 1200-seat vaudeville theater that closed in 1893. This venue, dubbed “The Corner,” was long associated with prostitution. 8. The building that once housed the Carlos is now home to a budget hotel named La Semana. Nice finds and interesting post. Seems funny now that artists were considered "Bohemian" just for going to restaurants like The Carlos.